Shiv Kumar Batalvi is considered a stalwart in modern Punjabi poetry. A quick web search tells you that he is the poet of lament and the internet is quick to define pathos as his genre. However, his writing is as much about true love and passion as it is about the agony it necessarily brings. In 1967, Batalvi became the youngest recipient of the Sahitya Akademi Award for his epic verse play, ‘Loona’, in which he retold a popular folk legend. A young girl is married to the father of Puran Bhagat, a pious saint. Despite him being her stepson, she is attracted to him and confesses her feelings only to be rejected. Legend has it that after this rebuke, she connives to have him exiled. However, Batalvi tells the story from Loona’s perspective, spinning the tale into one where the otherwise villainous woman becomes the narrator. 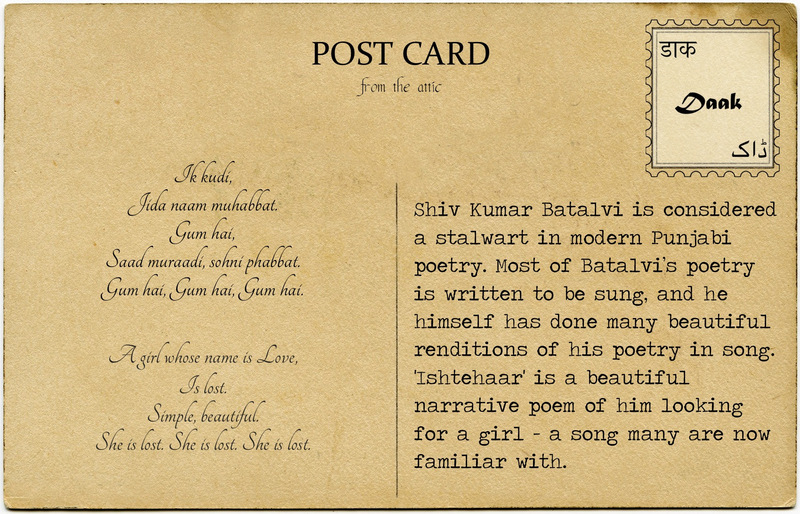 Much of Batalvi’s poetry is written to be sung, and he himself has done beautiful renditions of his poetry in song. Many stories and legends surround his romantic life. It is said that he fell in love with several women and his poetry springs from the dejections and sorrows these liaisons brought. However, this is a claim he has denied. You can watch him talk about this in an interview here, offhandedly denying these rumours and saying that he never quite accepted the love he got. One of these love poems was inspired by a woman who married someone else. After the birth of her first child he is said to have written a poem titled ‘Main Ek Shikra Yaar Banaya’ (I fell in love with a hawk) that has the following lines. Ohde sir te kalgi te ohdi pairin jhanjhar! Ve saada hathh gaya kumlaya! Ve asin dil da maas khuaya! Oh mud watni na aya oh mae in! So I fed him with flesh of my heart! That he never returned back! The next poem is a beautiful narrative about him looking for a girl. We have all become familiar with it because of its recent renditions in movies but at its core, it is said to be inspired by yet another woman he fell in love with, but who moved cities early in his youth. You can also listen to an intoxicating recitation of this poem in his own voice here. Yet she understands the language of a glance. She is beside me no more. What deception is this? What trickery? Her absence eats at me. But I am not able to see her. I keep dissolving in this grief. I keep melting in this grief. That she not stain my love. I will not be able to write a song.